If sleeping in a space pod in Iceland isn’t on your bucket list, well, now it is! The luxury Galaxy Pod Hostel in Reykjavik is not only the best hostel for a stopover in Iceland, but it’s also the introvert’s answer to hostels. During my emotional transcontinental move from England to the USA, I planned in a quick 2-night stopover in Iceland – partly because I’d been wanting to visit Iceland for years, and partly because I was in denial of my nomadic lifestyle ending. I spent ages looking for the perfect hostel for my layover: I love quirky, boutique hostels, that are super clean with a central location and low on cost… don’t ask for much do I?! Well, when I found Galaxy Pod Hostel in Reykjavik I was sold. Not only did it have great reviews, and was undeniably the cheapest option in Rekyavik, but I would get to sleep in a space pod. A SPACE POD. Galaxy Pod Hostel in Reykjavik: So What is a Space Pod? If you’ve read anything about Iceland, you’ve probably seen people referring to its “martian landscape” – that recognizable black lava mixed with green moss and billowing steam that could only belong in Iceland. So honestly, what better country to sleep like an astronaut in a space pod? I stayed in the 24-bed dormitory which had, you guessed it, 24 space pods. As I swiped my key card to open my space pod door, I felt so excited. 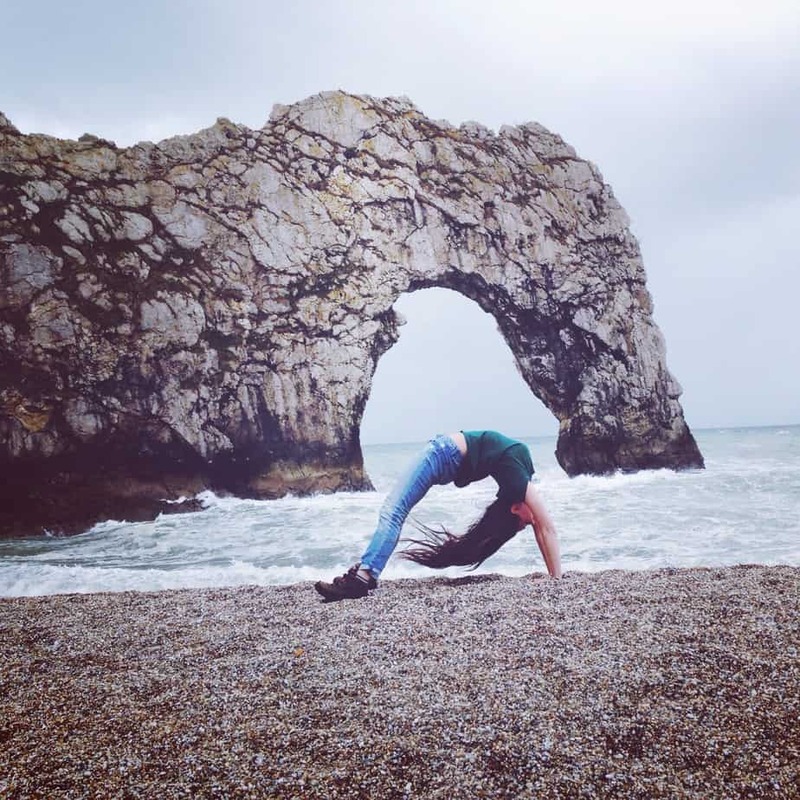 After a flight delay and a missed bus, and the emotion of leaving England, I was ready to just collapse in peace. My space pod door slid open to soft white bedding, and a long control panel. I inserted my key into the control panel and began playing with it. When the key is in the control panel, you can alter the lights, from black lights to reading lights to mirror lights, and all different levels. There was also a clock with an alarm setting, a safe, an adjustable air vent, and outlets that I could even fit my UK plugs into. Oh and to top it off – at the foot of the bed there is a TV screen! Unfortunately I couldn’t get mine to work, so I just spent my first night watching A Christmas Prince on my laptop instead. Because, ya know, I have fine cinematic taste like that. 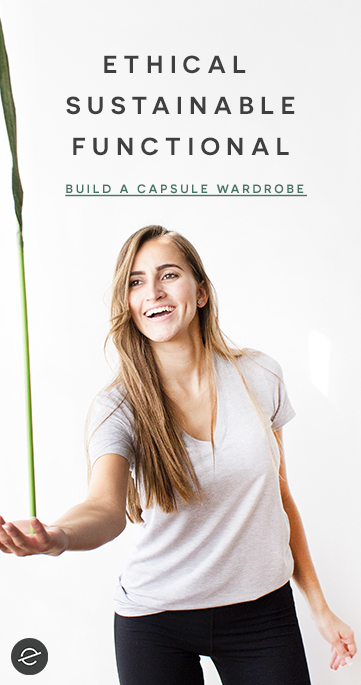 I found my space pod to be really…spacious (pun intended?). Granted, I am only 5’3″, but it is really spacious. I made a friend whilst I was there who was around 6′ and he had no complaints about the size of the pods either! When I posted about Galaxy Pod Hostel on Instagram, I got a few responses saying “wow, that is the perfect hostel for introverts!” And you know what – it totally is. But maybe not in the way you are thinking. I was actually more social at Galaxy Pod Hostel than literally any other hostel I have ever stayed at. I made two friends who I am still in touch with… I spontaneously road tripped the Golden Circle with one of them, and then that evening the three of us stayed out until 4am hunting for the Northern Lights. And this is from me, an introvert! I am a very friendly person, but I also consider myself an introvert, meaning I recharge my energy when I am alone (versus, extroverts, who are energized by being with other people). I love being social, but I have to balance this with alone time. Which means that usually when I stay in hostels, I can’t recharge my energy at the hostel because I’m constantly surrounded by people. Well, Galaxy Pod Hostel in Reykjavik totally reverses that. By having my own space pod, I used my time in there to recharge. To read my book, watch Netflix, just sit by myself on my phone without worrying about anything. Then, when I emerged from my space pod, I felt totally re-energized and ready to make friends and engage in that typical social hostel environment. So, Galaxy Pod Hostel is the ideal hostel for introverts – and I say this because having personal space helped me be more social, not less. 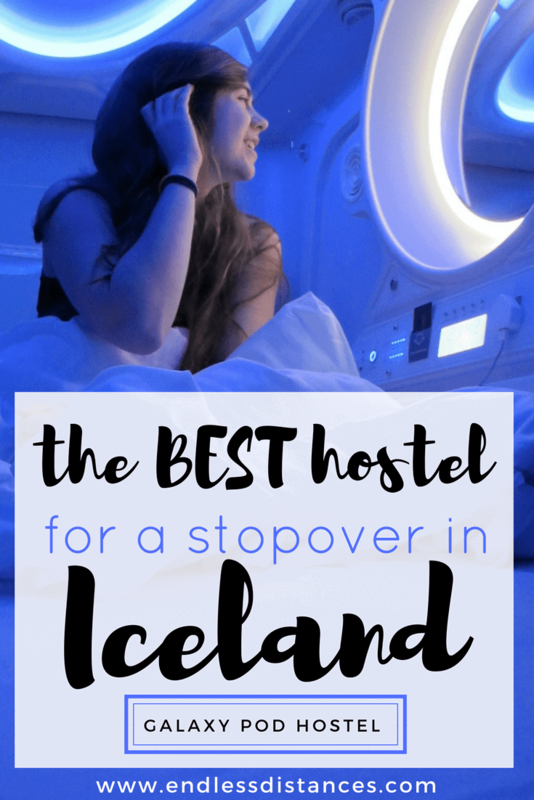 But jokes aside, I insist that Galaxy Pod Hostel in Reykjavik is the best not only hostel, but the best accommodation for a stopover in Iceland – especially if you are a solo traveler. It has an amazing location: the Flybus from Keflavik Airport literally drops you off on the doorstep (and will pick you up to take you back to the airport!). It is a ten minute walk into the city center. You can order a cappuccino in the lounge and watch the sunrise over the mountains. And the space pods are truly a bucket list experience! If you can’t tell, I really recommend a stay at Galaxy Pod Hostel in Reykjavik. Iceland itself is a mystery of a country which three days was not enough to experience, but the glimpse I got was incredible. How to Get to Galaxy Pod Hostel from the Airport: Take the Flybus, which will take you straight to the doorstep of the hostel! More details here. Otherwise if you have a car, you can just drive as there is parking right out front. Eco-friendly: Galaxy Pod Hostel has automatic lighting to reduce electricity usage, and they recycle. They are working on introducing even more eco-friendly attributes! 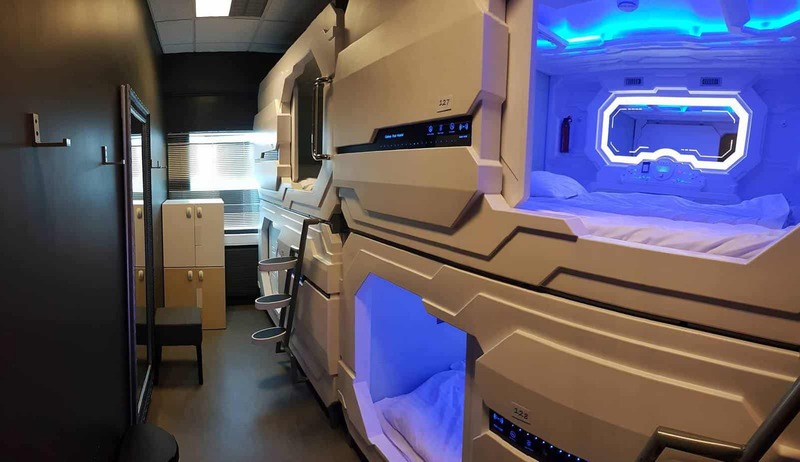 Price and Room Options: One pod in the 24 bed dormitory (this is what I had) is 7,000ISK, which is roughly equal to £50 and is the lowest price. There are also pods in 8 bed dormitory, a 6 bed all female dormitory, and a reservable 8 pod family room. To book your stay at Galaxy Pod Hostel, go here. *I received a complimentary stay at Galaxy Pod Hostel in exchange for an honest review. As always, all opinions are my own. *This post contains affiliate links. If you purchase something through one of these links I may make a commission. This comes at no extra charge to you, and helps me with the running costs of Endless Distances.